With the changing times, readers are reading in new ways, often online or with special reading devices. And more and more, they share what they read via social media outlets like Facebook, Goodreads, Library Thing and Twitter. Consumers spend hours each day browsing headlines, wall posts, feeds, etc. while interacting with each other. 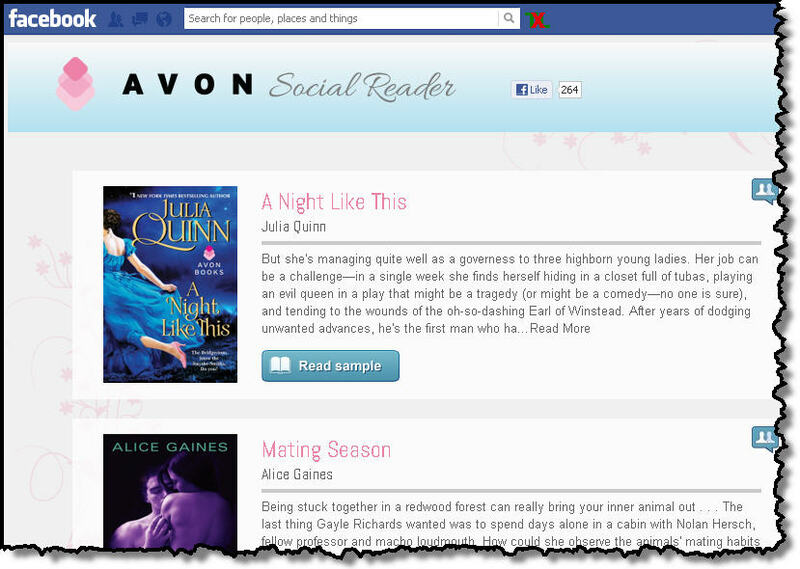 Now, Avon Books is releasing a free Facebook app, AvonSocialReader.com, which will give readers the chance to read excerpts from Avon’s latest books, share their favorites with friends, and discover new content based on what their friends are reading. Up to 20 percent of each book will be available to read, and once a book is browsed in the app, a person can choose to have that book show up in their News Feed or timeline for friends to see. There will also be clickable buy links to DRM-free editions of the selected Avon books from allromanceebooks.com. Consumers can also choose to purchase DRM-enabled versions of the books at other online retailers. Intuitive and easy to use, The Avon Social Reader is fully integrated within Facebook Platform, enabling readers to flip from status updates to book excerpts a friend is reading with one quick click. The more they use the app and interact, the better it gets!